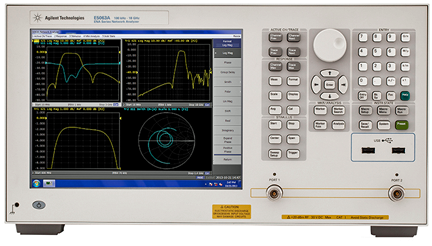 [SatNews] Agilent Technologies Inc. (NYSE: A) has announced the E5063A ENA Series network analyzer, a low-cost ENA solution for manufacturing test—the instrument offers optimized performance and functionality for testing simple RF passive components, such as handset/BTS antennas, RF cables and filters and it can also be used in R&D for evaluation of RF passive devices and dielectric materials. The Agilent E5063A offers the best balance of performance and cost. It provides excellent RF performance, including trace noise of 0.002 dBrms and the stability of 0.01 dB/degC. This feature helps reduce test cost without sacrificing quality. Using the E5063A with U1810B USB RF switch, engineers can build an economical multi-DUT test solution for testing four antennas with a single instrument, further reducing cost of test. With proven calibration and data analysis capabilities, including the fixture simulator function, the E5063A provides measurements consistent with the industry-standard Agilent E5071C ENA Series network analyzer. The combination of the E5063A and the 85070E dielectric probe kit offers an ideal economical solution for characterizing dielectric material, making it suitable for material researchers with limited budgets.